The philosophy of Sea Breeze Air Systems, Inc. is to keep a good thing going. Terry Cook has been in the air conditioning business since 1967. He attended five years of technical school while working as an apprentice. He acquired his Air Conditioning Contractor’s license in 1980. Terry’s background includes two decades working for Burg and DiVosta. After installing the air conditioning in Mr. DiVosta’s personal home, he moved to head the homebuilder’s department, where he was qualifier for the company. He was responsible for designing and overseeing the installation of the systems in all DiVosta built homes and condominiums. 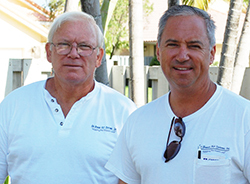 Terry Cook and his family founded Sea Breeze Air Systems, Inc. in 2004, vowing to provide quality air systems to Palm Beach County. Sea Breeze Air Systems delivers expert cooling, heating and indoor air quality solutions at reasonable prices, based on each customer’s personal needs and lifestyle.